I'm thrilled about today's guest post by Ravindra Shenolikar, my father. I get my love for reading and writing from him. So it's a privilege that he decided to write a post on my blog. His interests include reading, writing, photography, music, traveling and so on. You name it and there it is! And he is fantastic in all of those. 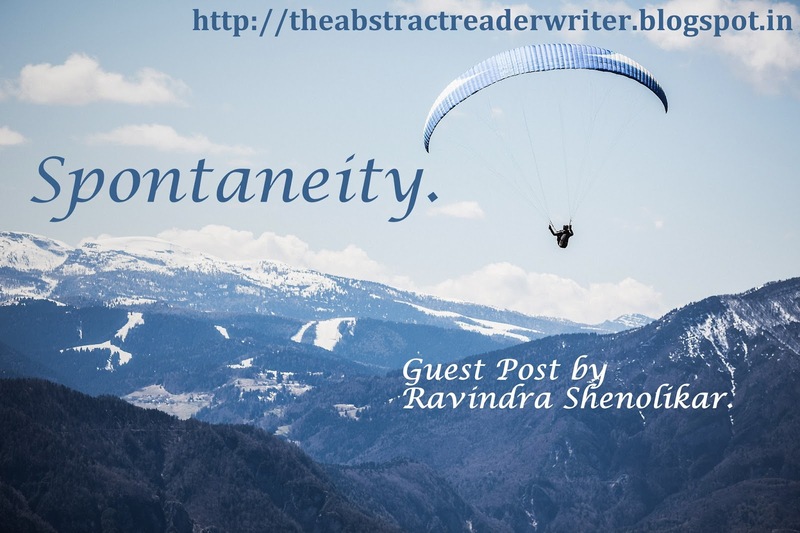 Here's a post about 'Spontaneity'. At birth spontaneity is at its peak. Then the graph starts to decline gradually. As we start observing, learning, imitating and emulating, the graph goes down. Spontaneity, which is the beauty of our being, suffers and chokes as we move through life. We try to be like someone else, get socially conditioned, get influenced by the culture and society that we live in and we do not know when artificiality has set in. Many a time we meet someone whose innocent laughter touches us. We meet someone spontaneous and instantly like that person. It is an acknowledgement of what we have lost and would have loved to retain. You see teenagers talking so fast, jumping from one topic to other whereas the oldies take ages to move from one topic to the next. This is the difference in spontaneity. We love the energy and chirping of the youngsters while trying to avoid the seniors who keep grinding. I remember how we used to go to matinee shows, music concerts, cycle trips and cricket matches. These used to be instant decisions which gave us so much joy and pleasure. Hardly any planning went into it. We used to live in the moment and for the moment. Our spontaneity was our driver. Can we shed all our accumulated conditioning of the past and bring back the spontaneity of youth in our lives. I think we can. It will return the moment we realise its true value and beauty. Perhaps then, the sunrise will be more beautiful, mornings full of energy and hope, the days shall acquire a new meaning and life will be full of bliss. What a thought-provoking article. It's so true that we lose our spontaneity as we grow older. If we can shed the worry of what other people think of us, as well as the constraints we put on ourselves, we can absolutely regain bubbly energy and a renewed spark for endless wonder and delight - all ingredients for spontaneity! Beautifully written. Your dad has a wonderful way with words, now we know where you get it. Thank you for sharing this on Blog Passion Project today. What an amazing beautiful post. I agree spontaneity is important to bring the wonder back to our lives. Thanks for sharing your insights with us. I love this! As more and more things come into our lives I think it can be hard to be spontaneous. It's something I need to do more of! What an inspiring post! So important to remember to live in the moment and break out of your routine when your soul needs it most. I'm trying to make a conscious effort to be more spontaneous. It's something that I'm really bad at, but something I know my husband likes to be. I do think we need to have moments in life that aren't completely planned!